Induction cooking heats a cooking vessel by electrical induction, instead of by thermal conduction from a flame, or an electrical heating element. The cooking vessel must be made of or contain a ferromagnetic metal such as cast iron or stainless steel. Heat is coming from within the pan, making this method of cooking a lot more efficient. 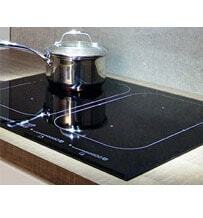 You therefore need to ensure that your pans are suitable to use on an induction hob. Copper or aluminium pans would not work unless they have additional layers added onto the bottom that are magnetic. The best way to check if your pans are viable is to see if a magnet will stick to the bottom of the pan! An induction hob contains a coil of copper wire underneath the ceramic plate, and when a cooking pot is placed on top an alternating electric current is passed through it. The resulting oscillating magnetic field induces a magnetic flux, producing an eddy current in the ferrous pot, which acts like the secondary winding of a transformer. The eddy current flowing through the resistance of the pot heats it. To find out what an eddy current is, see below. 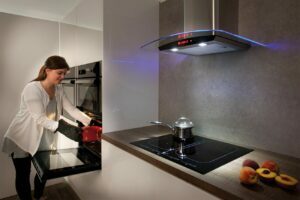 Energy transfer with induction hobs is around 84 percent compared to around 74 percent for gas or ceramic electric so there are good energy savings. Safety is an important aspect too – there is no naked flame so fire is extremely unlikely. 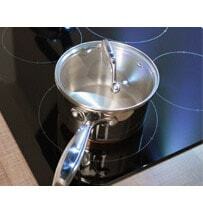 A pan of water will boil in nearly half the time that it would on a normal gas hob. 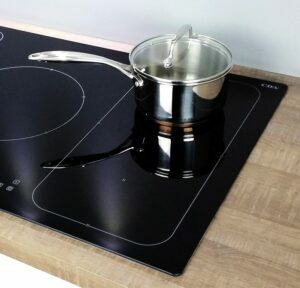 An induction hob will also ensure the longevity of your pans because they have more contact with the heat below, and the current is running all the way through the pan. 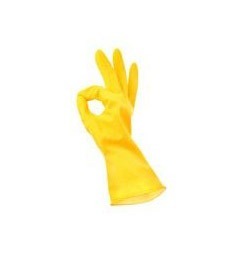 This will stop your pan from developing hot spots which in turn, will burn or scorch food. 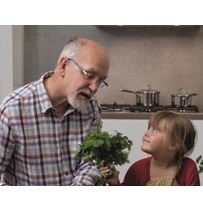 To view our full hob range, click here. An eddy current is a current that circulates in conductors, and has been induced in a conductor by a varying magnetic field. 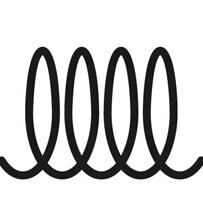 In layman’s terms, Eddy currents are loops of electrical current that are created in the conducting material by a magnetic field that changes from positive to negative. The current is created by changing the magnetic field. Eddy currents can heat up a metal object without touching them, they are also well known for stopping trains and rollercoasters. They can be found in other objects such as electric brakes, car speedometer and energy meters, so you may be familiar with where eddy currents can be found. Electrical induction is also called magnetic induction. It is the ‘voltage’ produced in a conductor due to its reaction with a magnetic field. Electromagnetic induction is the movement of magnets around a coil of wire that then create an electrical current through the wire. This can be done by rotating magnets while a coil of wire moves between them. The magnets will rotate between north and south poles, if the north pole of two magnets were to be pushed together they would repel and try to move away from each other. But if south and north poles were to come together they would pull, as they are opposites and therefore attract. It is this push and pull that causes the magnets to rotate around the coil of wire, producing an electrical current. It’s true. Due to the strong electromagnetic field created by an induction hob this type of hob could affect your pacemaker if you have one fitted. According to The British Heart Foundation (BHF) pacemaker wearers should keep a distance of at least 60cm or 2ft from the appliance as it may interfere with your settings. 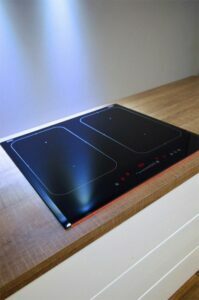 The BHF have said that an induction hob would not cause significant damage to your device, but due to there being many different types of pacemakers, each could be affected in a different way.